I don’t go to Starbucks often but I spotted the shirt inside and decided to walk in. 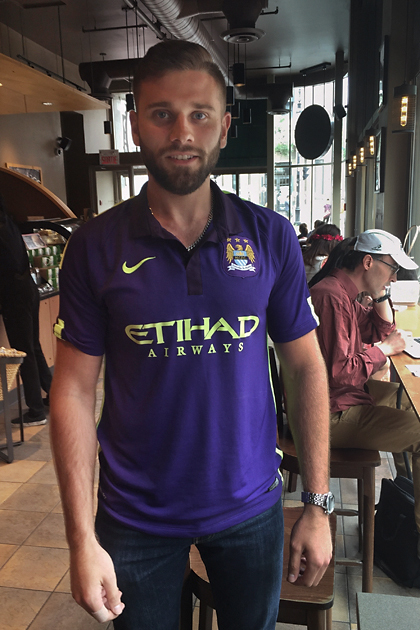 Born in Canada, in Ottawa, to English parents, Rob is a life-long soccer fan. He lived in Montreal for a number of years but not anymore. Currently he lives and works as transport engineer in Abu Dhabi. After I got back home I looked up the City team (finished the season at 15th place) that played in that game vs. West Bromwich (relegated): Vassell, Sinclair, Bradley Wright-Phillips, Barton, Claudio Reyna, Danny Mills, Sibierski, Musampa, Andrew Cole, David Sommeil, Ben Thatcher, etc… Well, it must have been a great atmosphere at the stadium to win Rob’s heart because I doubt this City team could do it. City fan myself and this happens to be the first post I’ve come across on WordPress. Coincidence? Will be posting about city/football in general in the future and would appreciate any followers. while my husband has played and followed football as long as he could remember, he is a giant fan of Tottenham Hotspurs, the only team he wouldnt watch is Arsenal. although he also knows a lot about them as well. I do not argue with him or tell him he is wrong as there is not a lot he doesnt know about the game.